While this year’s Tour has been action-packed since it started last Saturday, for road.cc it means something entirely different… namely driving between lots of hotels, borrowing bikes and trying to use socks as a bargaining tool in order to do so. 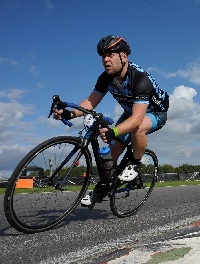 This was my first trip out with road.cc to the Tour de France, which is technically a trip out for the days leading up to it because we left the night before the opening stage! Our priorities lie with seeing who’s riding what, possibly digging up some gossip from the team camps and shooting some videos along the way, and this affords us a chance to see the event village and get all the info we need. Myself, Mat (tech editor) and Matt (video editor) headed to Caen via Portsmouth the morning after England’s victory over Columbia, and then embarked on a four hour drive to the town of La Roche-sur-Yon in the Vendee region, where the Grand Départ was taking place. The town had gone Tour-mad, with numerous yellow monuments to the race and a big event village right in the centre. Some of the teams were based right in La Roche-sur-Yon, but as we soon found out many had spread themselves quite far away from the centre of the action, so it would take a fair few journeys to visit all the teams we wanted to call in on. The next morning we set off for Team Sky's hotel, and made our first attempt to sidle up to a team mechanic and ask if we could borrow a bike for some filming. Reluctantly he offered us a pristine Pinarello Dogma belonging to Wout Poels, before telling us off for trying to weigh it, then we tried to clear the air by handing the mechanics some road.cc socks - in lieu of anything really valuable to use as a bargaining tool or official accreditation, this is genuinely what we were handing out in an attempt to get the teams to warm to us. What we lacked in tempting bribes I like to think we made up for in charm, and the thinking was that it might at least make them remember us for next time! Surprisingly numerous teams responded well to the sock 'bribe', and we managed to get hold of Nibali's Merida Reacto, Bauke Mollema's all new Trek Madone and hung out with Team Mitchelton–Scott for an hour or so. The public had cottoned on to where the teams were staying at each stop we made, and it seemed like some had planned a full day's riding while stopping off at team camps along the way. The team locations aren't exactly closely guarded secrets and there is every chance you can catch a glimpse of Sagan, Froome et al if you wait around either before or after their training rides, that seemed to depart at 10am-ish and return three to four hours later. A couple of team crews that I won't name weren't overly friendly, perfectly understandable as their priorities were with getting the bikes and equipment in tip top condition of course; however some were incredibly forthcoming, particularly Bora–Hansgrohe (we didn't even need to give them socks). Peter Sagan stopped to chat to a few kids and sign autographs on his return from a training ride, and appeared as friendly as he is entertaining. Movistar were also staying in the same complex as Bora–Hansgrohe, where we witnessed Nairo Quintana hopping straight onto a turbo trainer and smashing out 20 minutes straight after his ride; from what we could gather, he simply hadn't got the workout he wanted from training on the open roads due to heavy traffic! Arriving back in La Roche-sur-Yon after a hard day’s hotel-hopping, we went to watch the Team Presentations and rider procession to soak up the atmosphere. After getting a few snaps we stopped at a bar to refuel, and it just so happened that none other than Eddy Merckx was sitting in the corner watching the world go by. Now anyone who thinks the Tour de France may suffer from a bit of the old boy’s club mentality… well on this evidence, you’d be absolutely right. Merckx was surrounded by about eight men in suits quaffing champagne and smoking expensive cigars, only moving to allow him to have his photo taken with two ladies (for which Mat stepped up and took the snap above). It was an odd and bemusing situation, but all the same pretty cool to see The Cannibal making a guest appearance at the event he dominated all those years ago. After the procession had finished and people had stopped booing Team Sky, we stopped off at a shop to grab a takeaway nightcap. It was here where we experienced our first and only taste of anti-English discrimination during the trip (to our faces anyway), at the hands of a weathered gentleman in a France football shirt with a number drawn on the back in Tipp-Ex, who appeared as if he’d had a few too many: "ahh les rosbifs!" he declared to the shopkeeper. I always thought it was a myth that this was a genuine insult towards the English, but it was great to see our inebriated French friend was still carrying a torch for it. When he saw us buying beer he then changed his tune and told us it was his birthday, but we were already cut pretty deep by this point... blown it. On the way back to the ferry port we stopped off at a tiny bar in the middle of nowhere to catch the second half of France vs Uruguay in the World Cup quarter final (the rest is history of course) and then when we got to Caen, went in search of a place with food and a TV to catch Belgium vs Brazil. This might seem like a simple task at first, but not so much when you need at least one of those food options to be vegetarian, in France. Employing our best schoolboy French we tried in vain to ask the waitress if there was anything on the menu that was veggie-friendly or at least could be modified into a meat-free meal, to which she appeared utterly bemused: “seulement petit jambon?” she says pointing to the menu, suggesting that Mat might be happy with the Croque Monsieur because it only contained a little bit of ham; in the end, he waited till we got on the ferry while we ate our very meaty burgers. We hope you've enjoyed our tour tech coverage so far: check out our comprehensive guide to the bikes of the 2018 Tour de France and this video on Peter Sagan's Venge for starters! 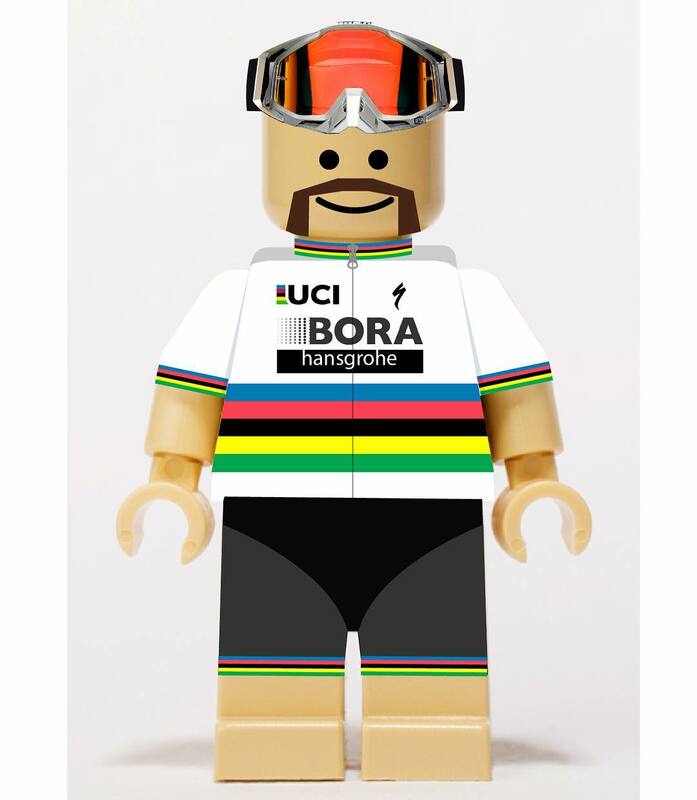 Peter Sagan looks like an action figure in that picture above... in fact I've just decided that I'd probably happily buy an action figure of Peter Sagan which is a little odd considering my age and current lack of toys.